Purpose: The decline in advanced breast cancer stages is presumably the most relevant surrogate parameter in mammography screening. It represents the last step in the causal cascade that is expected to affect breast cancer-related mortality. To assess the effectiveness of population-based screening, we analyzed the 2-year incidence rates of advanced breast cancers between women participating in the initial and in the first subsequent round. Materials and Methods: The study included data from 19 563 initial and 18 034 subsequent examinations of one digital screening unit (2008 – 2010). Data on tumor stages, detected by screening or within the following interval of two years (2-year incidence), were provided by the epidemiological cancer registry. Rates of all and combined UICC stages 2, 3 and 4 (advanced stages) were reported for a two-year period. Proportions were tested for significance by using chi-square tests (p < 0.001). Results: The 2-year incidence rate of all stages was significantly lower in participants in subsequent screening than in initial screening (0.85 vs. 1.29 per 100 women (%); p < 0.0001). A significantly lower 2-year incidence of advanced stages was observed for subsequent screening compared to initial screening (0.26 % vs. 0.48 %; p = 0.0007). Among women aged 50 to 59 years, the incidence of advanced stages was less clearly different (0.21 % vs. 0.35 %; p = 0.07) than in women aged 60 to 69 years (0.31 % vs. 0.70 %; p = 0.0008). Conclusion: During the change from prevalent to incident phase mammography screening, a program impact is seen by a lower 2-year incidence of advanced breast cancers within subsequent compared to initial participants, predominately in women aged 60 to 69 years. • The incidence of advanced tumor stages represents the most relevant surrogate parameter for screening effectiveness. • For the first time the 2-year incidence of advanced breast cancer stages after subsequent mammography screening was analyzed. • We observed a significant effect of screening on the 2-year incidence of advanced stages, predominately in the age group 60 to 69 years. Ziel: Die Abnahme fortgeschrittener Brustkrebsstadien ist der relevanteste Surrogatparameter eines Früherkennungsprogramms. Er stellt den letzten Parameter der kausalen Kaskade dar mit einem zu erwartenden Effekt auf die Brustkrebs-spezifische Mortalität. Um die Effektivität des populations-bezogenen Mammografie-Screenings zu bewerten, wurden die 2-Jahresinzidenzraten fortgeschrittener Brustkrebsstadien nach initialer und erster Folgerunden-Teilnahme analysiert. Material und Methoden: Die Studie schließt 19 563 initiale und 18 034 erste Folgeuntersuchungen einer digitalen Screening-Einheit ein (2008 – 2010). Die Brustkrebsstadien, diagnostiziert im Programm oder im nachfolgenden zweijährigen Intervall (2-Jahresinzidenz), wurden durch das epidemiologische Krebsregister erhoben. Raten aller und kombinierter UICC-Stadien 2, 3 und 4 (fortgeschrittene Stadien) wurden für eine 2-Jahresperiode analysiert. Die Proportionen wurden auf Signifikanz durch den chi-Quadrat-Test getestet (p < 0,001). Ergebnisse: Die 2-Jahresinzidenzrate aller Stadien lag bei Frauen der Folgerunde im Vergleich zur Erstrunde signifikant niedriger (0,85 vs. 1,29 pro 100 Frauen (%); p < 0,0001). Im Folgerunden-Screening wurde eine signifikant niedrigere 2-Jahresinzidenz fortgeschrittener Stadien im Vergleich zum Erstrunden-Screening beobachtet (0,26 % vs. 0,48 %; p = 0,0007); bei Frauen von 50 bis 59 Jahren war der Inzidenzunterschied geringer (0,21 % vs. 0,35 %; p = 0,07) als bei Frauen von 60 bis 69 Jahren (0,31 % vs. 0,70 %; p = 0,0008). Schlussfolgerung: Im Übergang von der Prävalenz- zur Inzidenzphase des Mammografie-Screenings ist eine Programmwirksamkeit anhand einer niedrigeren 2-Jahresinzidenz fortgeschrittener Brustkrebserkrankungen unter Folgerunden- im Vergleich zu Erstrunden-Teilnehmerinnen, insbesondere zwischen 60 und 69 Jahren, zu verzeichnen. • Die Evaluation der Inzidenz fortgeschrittener Tumorstadien stellt den relevantesten Surrogatparameter für Brustkrebs-Früherkennungsprogramme dar. • Erstmals wurde die 2-Jahresinzidenz fortgeschrittener Brustkrebsstadien nach Teilnahme am Folgerunden-Screening analysiert. • Wir beobachteten einen signifikanten Einfluss des Screenings auf die 2-Jahresinzidenz fortgeschrittener Tumorstadien, vorrangig in der Altersgruppe 60 – 69 Jahre. 4 Heidinger O, Batzler WU, Krieg V et al. 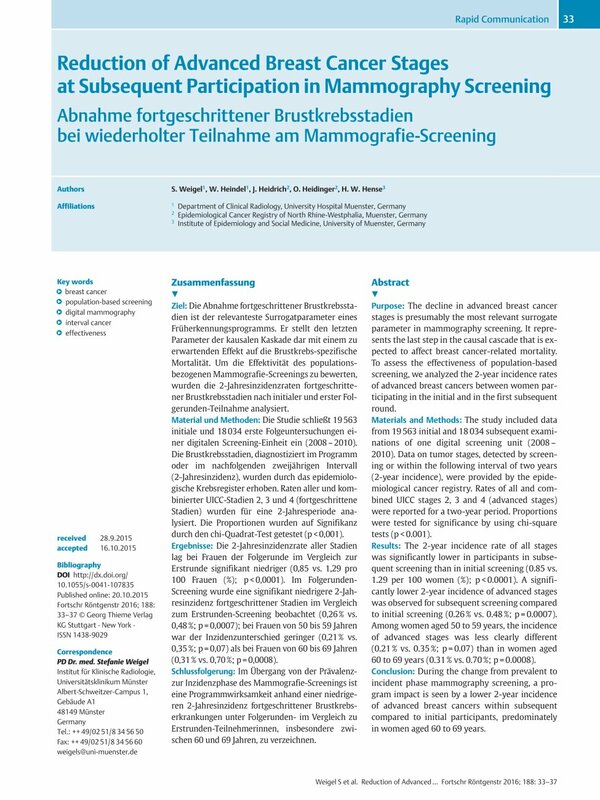 The incidence of interval cancers in the German mammography screening programme—results from the population-based cancer registry in North Rhine–Westphalia. Dtsch Arztebl Int 2012; 109: 781-787 DOI: 10.3238/arztebl.2012.0781.